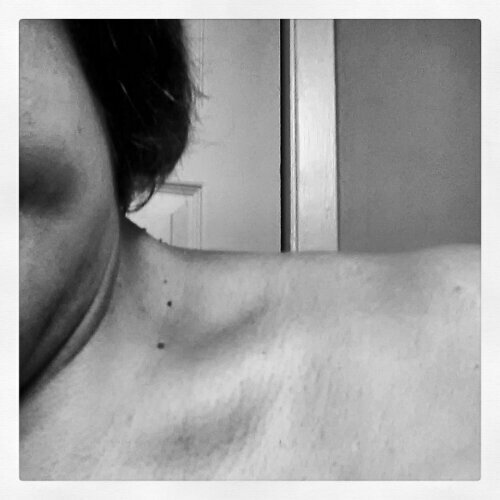 I have never in my entire life seen my collarbone. Now, mind you I am flexing my shoulder, but still. I can see and feel my collarbone. I can feel my sternum and ribs, and when I lay down, I can feel the iliac crest of my pelvis. Such bizarre feelings to feel my bones emerging from under my flesh! I decided today to revise my fitness goals and to set a new one. I decided to revise my running goal. I really want to get a little more weight off before I stress my knees any more than they have already been. I’m going to start Couch to 5K when I get down to 270 pounds. This is 25 pounds away for me. Since it will likely be cold when this happens, I will do any running I have to do at the indoor track at our local rec center. I get hives when I get overly cold and don’t want that to take away from the fact that I’m trying to run, even if it is a slow trot. I’m going to sign up for a fitness boot camp when I get to my surgeon’s goal, which is 220 pounds. I see them all the time in my school’s parking lot and wish I could participate. One afternoon I saw them out there, and I told myself someday that will be me. And it will be. Hopefully by my birthday in March. So the two gifts I will give myself for my birthday will be a Bleecker tote from Coach and a boot camp class. Now I need to find one locally that is good. I have a couple of ideas about ones I’ve heard that were good, but I need to do a little more research. 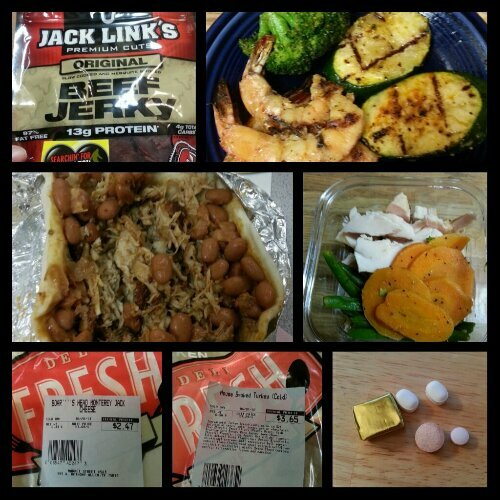 Today’s food choices, from upper right: leftover grilled shrimp with broccoli and grilled zucchini; Oscar Meyer deli chicken breast with carrots and green beans; multivitamin and calcium supplements x2, B12 and iron supplements, vitamin C and D supplements (not shown); smoked turkey with a slice of Monterey Jack cheese; guts of a breakfast burrito made with smoked turkey and pinto beans; Jack Link’s beef jerky. This entry was posted in celebrations, daily bites, eating, goals, NSV's, success, vsg, weight loss surgery and tagged body image, daily bites, exercise, fitness goals, goal setting, NSVs, photo post, post-op eating, post-op life, VSG, vsg realness, WLS, workin' on my fitness. Bookmark the permalink.